Even with the popularity of cloud storage, there will always be a place for keeping your data local. For creative professionals and growing businesses, these on-site storage solutions need to be able to keep up with their demands. Engineered with performance even in multi-tasking environments in mind, Synology’s answer is the highly-anticipated Synology DiskStation DS1618+ (Check price on Amazon). Let’s see if it can deliver. 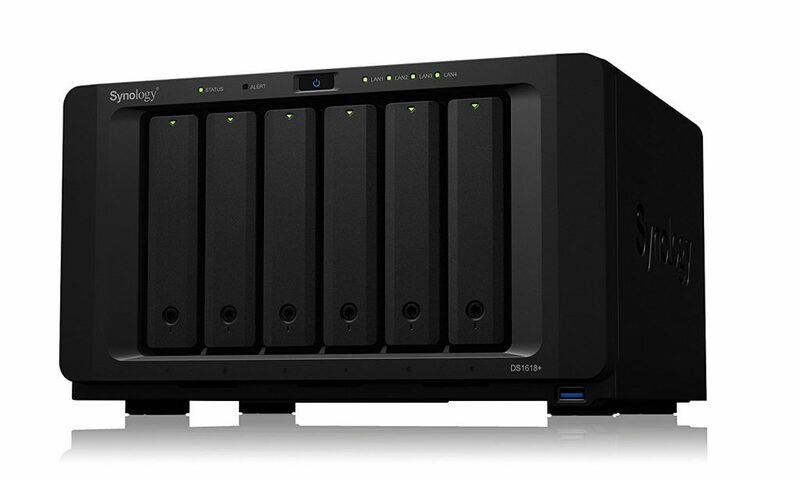 One look at the Synology 6 Bay NAS DiskStation – DS1618+ and you’ll know it means business. 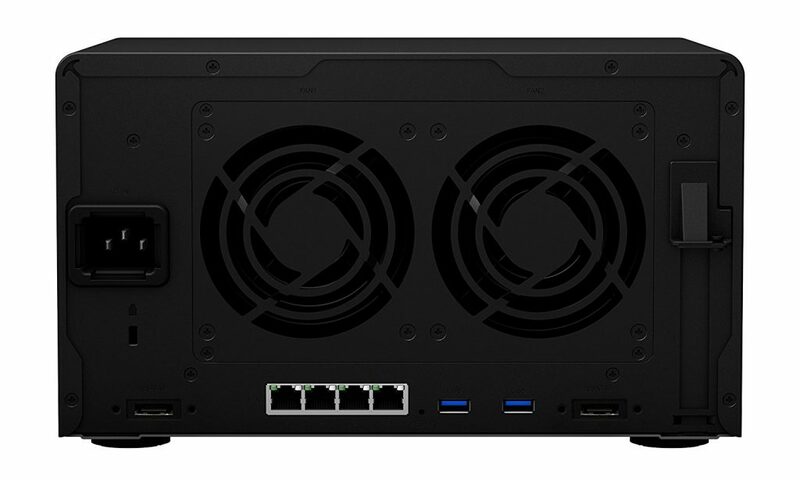 This NAS box has six hard drive slots that are all hot-swappable. The drive bays are accessible from the front and the drives themselves can be secured using a built-in lock and key. The power button and the standard LEDs for power, alert, network activity, drive activity, are all conveniently found on the front of the unit. There’s also one USB 3.0 Type A port for plugging in external storage devices. However, there’s no one-touch USB copy button in sight. Considering smaller models like the Synology DS718+ have this button, it’s curious why Synology decided not to include it on the DS1618+. If you need to move files to or from an external drive, you’ll have to do it manually through the DiskStation Manager (DSM) interface. At the back of the DS1618+ are two more USB 3.0 Type A ports, two eSATA ports, four RJ-45 Gigabit Ethernet ports, the power port, and the PCIe expansion slot. Keeping everything at proper operating temperatures are a pair of fans that exhaust air through the back. Powering the DS1618+ is a quad-core Intel Atom C3538 CPU. This is a welcome upgrade from the old Atom C2538 chips found it Synology’s older NAS boxes. Considering many other vendors have been using the C3XXX series CPUs since early 2017, it’s about time as well. When it comes to memory, the unit ships with 4 GB of DDR4 preinstalled with support for up to 32 GB of RAM. There’s also support for Error-Correcting Code or ECC memory to help prevent data corruption. On the motherboard, you’ll find two unpopulated expansion slots. One is the open slot for RAM upgrades and the other is a PCIe slot that supports different add-in cards. You can use the latter to install M.2 SSDs for file caching or a 10 GbE network card for faster data transmissions (as long as your network supports it). 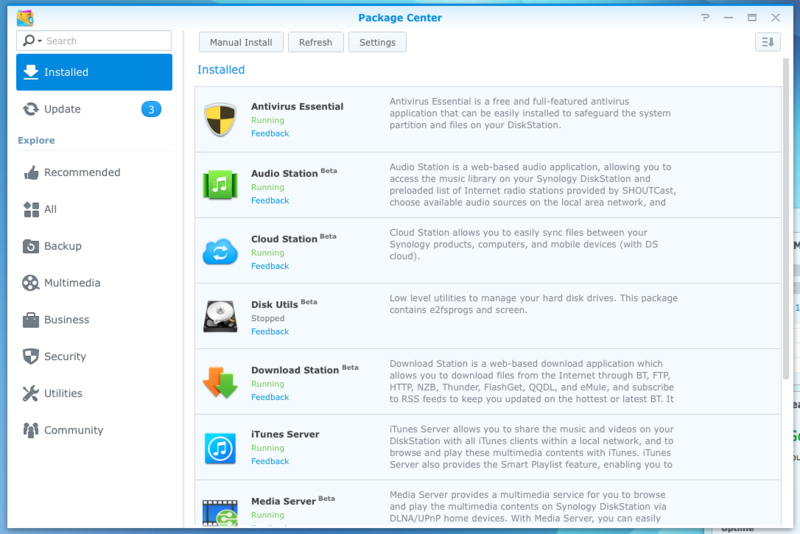 While the DS1618+ is pretty good out of the box, Synology has designed it to be capable of even more. With tons of upgrade and expandability options, what you have is a future-proof device that will keep up with yourdata storage needs for years. At the back of the unit are two USB ports. Like the one found in front, the two USB ports can be used for moving files to an external storage solution. You can also use it to connect to a UPS to make sure your NAS stays on in the event of a power outage. If you need even more storage than what’s available in its stock configuration, that’s where the eSATAports comein. 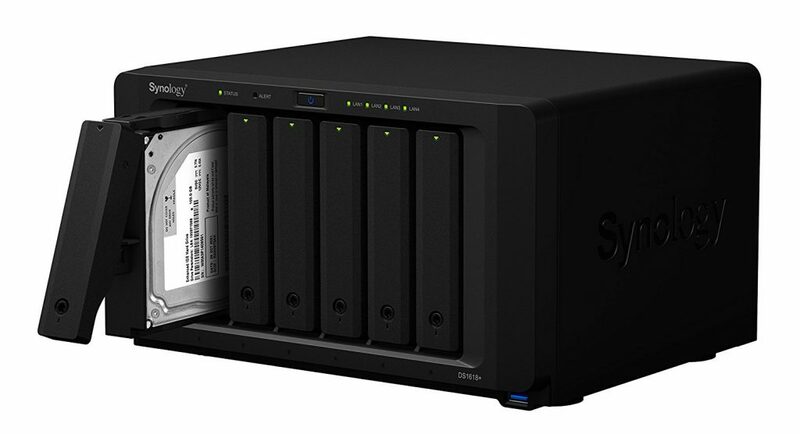 Synology offers the DX517, a five-bay expansion unit that’s compatible with the DS1618+. Connect one of those to each of the eSATAports and that brings the total number of drives to a 16. Since the NAS supports up to a 12 TB for a single hard drive, hooking up two expansion units will give you up to a whopping 192 TB of space! And those four Gigabit Ethernet ports? They support Link Aggregation and Failover. By combining the network connections of each Ethernet port, you can have speeds way beyond what a single connection can offer. Even if one of those connection fails, this NAS will stay online through the remaining active connections. As we’ve already mentioned, this NAS supports up to 32 GB ofRAM. Officially, you’ll have to get Synology-branded ECC memory modules to reach that maximum capacity. They’re a bit on the expensive side but some users have reported being able to use third-party RAM sticks. Some have even had success using non-ECC memory kits. 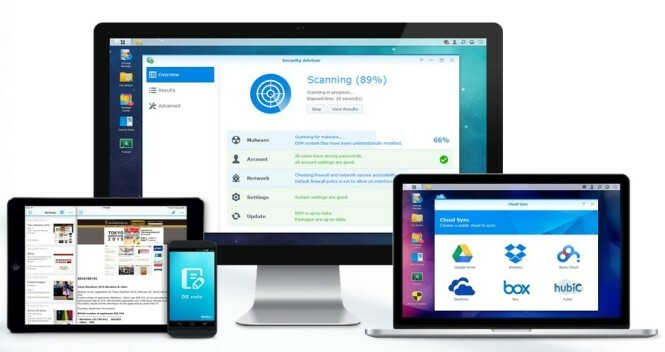 The catch with using non-Synology memory is the loss of full warranty coverage and an error notification about incompatible memory configuration in DSM. This risk may not be worth it if you’re running a business but if you’re a hardware enthusiast, you probably know what you’re doing anyway. If your workload demands even faster speeds than the Ethernet ports can offer, the internal PCIe slot has you covered. Simply add a 10 Gigabit Ethernet card to the PCIe slot and you’ll have more than enough bandwidth for your needs. But if bandwidth isn’t a priority, the PCIe slot has another use. Install Synology’s M2D17 Dual M.2 SSD adapter card into that slot and you can enable SSD caching. Whether you need this feature or not will depend on your workload. If you’re simply using the NAS as a backup then there’s not much benefit to an SSD cache. But if you or multiple people are accessing the same files in the NAS over and over, it will definitely be a noticeably faster experience with the SSD cache. Targeted at enthusiasts and small to medium-sized businesses, the DS1618+ offers more than enough features for this market. If you need something to backup, store, and manage large amounts of data, this NAS is worth a look. People dealing with large media files, either as a professional or just for entertainment, will also benefit from the connectivity speeds and storage capacity that’s possible with the Synology DS1618+. Home users who want to stream video to their devices can also take advantage of its 1080p transcoding support. Growing businesses can rest assured that this NAS can keep up as their business grows. And with the easy to use DiskStation Manager, you don’t have to be the most tech-savvyperson to make the most of the DS1618+. At $800, this NAS box is all about options. Six bays are plenty for even the most demanding users yet there’s support for up to 16. Connection speeds can also scale with network demand either through Link Aggregation or a 10 GbE add-on card. The price may seem a bit steep for the average consumer but for the enthusiast, professional or business owner, the features and convenience it brings could outweigh the cost. 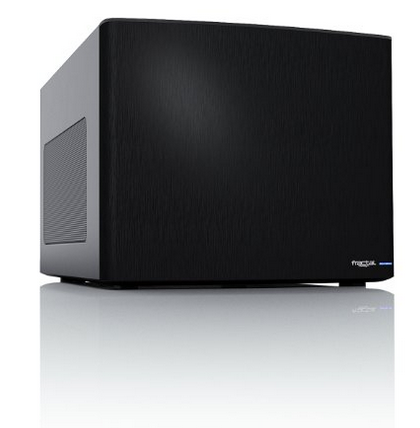 The DS1618+ definitely has the potential to be the only NAS you’ll ever need.